Our Feelings Bingo game is another excellent resource to help increase and reinforce children’s feelings vocabulary. Included are 32 colourful game board cards, each with six different feelings faces on the front, and 30 different feelings faces on the back. Each player is given a game board card and six counters (counters not included). 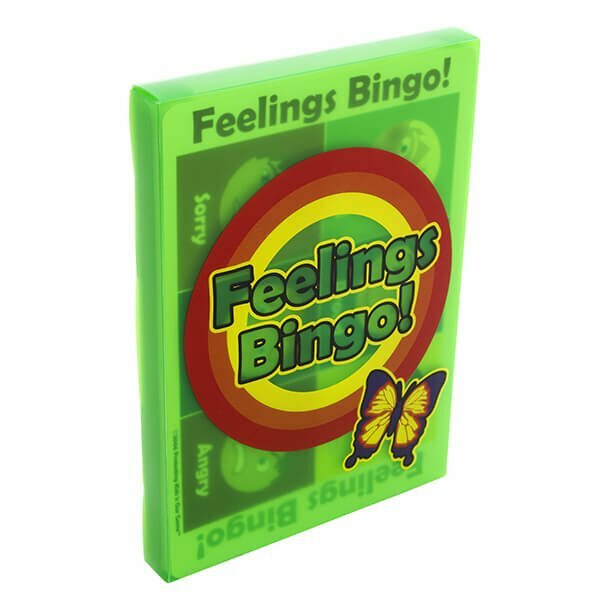 Feelings are selected at random from the back of one of the game board cards, or, you can randomly select the feelings from our Feelings Cards game or our Feelings Poster (Feelings Cards game and Feelings Poster are not included). When a feeling is called out, and a player has that matching feeling on their game board card, they place a counter on that feeling or they can use a white-board marker and mark it with a cross (white-board markers not included). The first player with all six feelings on their game board card covered by a counter or crossed out is the winner. There are many variations you can add to this game to help expand children’s feelings vocabulary. For example, when a feeling is called out, ask a child who has that feeling on their game board card to put that feeling into a sentence or provide the definition of the feeling. If they get it right, they could win a prize. Expanding children’s feeling vocabulary can assist in body safety education, as it helps children express their emotions if they are feeling unsafe. Other items in our feelings and emotions range include our Feelings Cards game and Feelings Poster.